A Buttermilk Falls Wedding Photographer is filled with charming images of joyful celebration. The Buttermilk Falls Inn and Spa is located a short distance from New York City in scenic Hudson Valley. The venue is perfect for wedding ceremonies and receptions, corporate retreats and other special occasions. The inn is set on a 75 acre estate, with a luxury spa and working farm that give guests the best of both worlds. A Buttermilk Falls Wedding Photographer captures the sweeping picturesque views that are unique to the venue. The inn and spa provide an escape for those living in the Tri-State Area that is not too far away. The location has a few airy cottages and houses and 10 polished, individually decorated rooms in the main house, each with breath-taking window views. Each living space has numerous amenities to accommodate the needs and wants of couples and their guests. This photograph, taken at a Buttermilk Falls Inn wedding, shares a moment during the reception. The bride is at the center of the image, in a crowd of family and friends, with the celebration in full swing. The berry red of the bride’s lipstick frames a delighted smile, and laughter escapes from her mouth as friends grab chairs to lift the newlyweds up into the air. The wedding reception took place in a tent, with strings of lights lining the ceiling, twinkling above the merriment below. Beside the bride is her father, who is enjoying this day as he hands his daughter over to a man who is truly worthy of loving her. 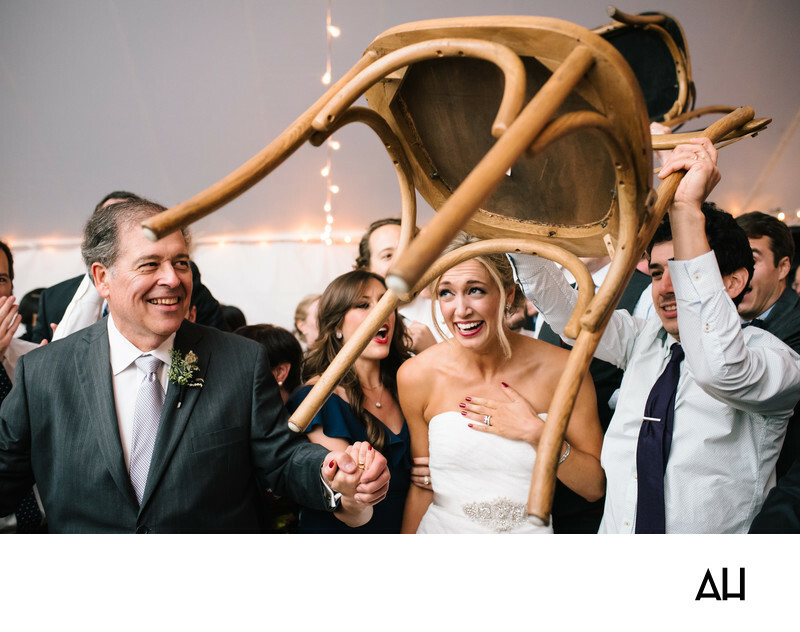 He also finds the antics of the couple’s friends amusing and joins his daughter in whole-hearted laughter.